1) Peppermint. Often used to help clear the sinuses and treat allergies, peppermint is among the most common medicinal herb. It's traditionally infused into a tea to help digestion and menstrual pain, and breathed as vaporized oil to help aid in quelling respiratory ailments. 2) Garlic. A pungent bulb from the onion family, garlic does almost everything. It's an antiseptic, anti-inflammatory, and anti-cancer herb that helps boost the immune system and ward off colds and coughs. 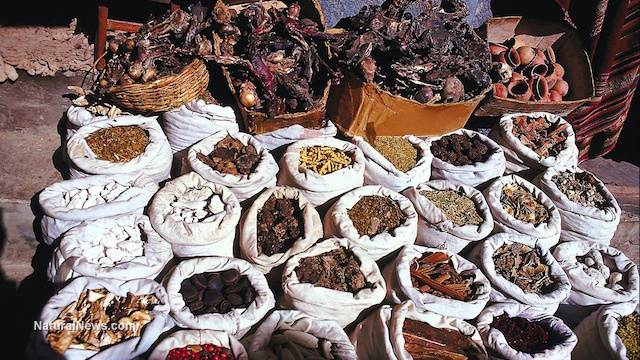 It can also treat skin infections, intestinal worms, and sinusitis. 3) Echinacea. The root of this plant is a powerful immune booster that helps prevent and treat infections. It also shows efficacy as a remedy for shingles, ulcers, influenza, and tonsillitis, as well as a fix for nausea, aches, and pains, and blood poisoning when used homeopathically. 4) Aloe vera. The gel of this desert plant can be rubbed on the skin to treat sunburns and other skin injuries. It can also be consumed to help cleanse and repair the bowel, thus helping to improve digestion. 5) Feverfew. Similar to echinacea, feverfew has long been used in traditional herbalism to treat migraine headaches and reduce arthritic pain. 6) Evening primrose oil. Rich in the omega-6 fatty acid Gamma Linolenic Acid, this native American wildflower seed oil helps reduce joint stiffness and is also said to help boost cognitive function and concentration. 7) Marigold. These bright orange flowers can be brewed into a tea and used to treat topical inflammation and varicose veins. It is also beneficial in helping to treat fungal infections, as well as gargled to help fix a sore throat. 8) Ginkgo biloba. Rich in flavone glycosides, ginkgo biloba helps improve circulation by naturally thinning the blood, which has the added effect of helping to boost memory. 9) Ginger. A flavorful remedy for stomach pain and nausea, this root plant contains a host of pain-relieving compounds that, in many cases, make it a better option than over-the-counter pain pills. 10) Arnica. Often used as a homeopathic remedy for pain, this yellow mountain plant is widely known to help the body heal itself more quickly from an injury. It can also be applied directly to bruised or damaged skin that hasn't been broken to relieve inflammation. 11) Frankincense. A gum resin extracted from the frankincense tree, this North African oil can help relieve anxiety and stress. This anti-aging herb is also known to help heal stomach ulcers, skin wounds, and respiratory conditions. 12) Chamomile. This flowery plant from Europe is often used in herbal teas, and for good reason: it helps soothe digestion, relieve the aches and pains associated with menstruation, and relax the nervous system. 13) Ylang Ylang. A tropical tree from Madagascar and Southeast Asia, Ylang Ylang oil also helps soothe the nervous system, as well as helps address sexual problems and impotence in men. 14) Wild yam. This herb is often used homeopathically to treat abdominal pain and renal colic. It's also beneficial for women going through menopause. 15) Lavender. One of the most pleasant smells in existence, lavender is a soothing herb that can help improve sleep quality while minimizing stress. It can also be applied topically to treat wounds, burns, stings, and even as an insect repellant.